Mobile cuisine has been part of American culture since the latter part of the 17th century when street vendors sold food from pushcarts in New York City. The modern food truck craze, however, started in 2008 in Los Angeles and developed into a culture that is equal to the restaurant concept. In recent years, getting your lunch from a truck seems to be almost fashionable, and many food truck operators started tapping into sentiments associated with modern America, including healthy eating, environmentally friendly catering solutions, and social media. Because of food trucks’ growing popularity, the value of the food truck industry increased from $803.8 million in 2014 to $856.7 million in 2015. But what is happening to the food truck industry today? Is it still viable to open a food truck business? In 2010, the U.S. government added “Tips for Starting Your Own Street Food Business” to its small business website. The following year, President Barrack Obama tweeted the name of his favorite food truck in Washington, D.C.
Food trucks also featured in popular films such as The Five Year Engagement, What to Expect When You’re Expecting, and Chef. Some cities, including Portland, Oregon, designate vacant land for food truck clusters because the trucks have significant benefits for residents. Because of these and other developments, many people started realizing that there is a lot of profit to be made from food trucks, especially since the start-up costs of a food truck business is relatively low. Average start-up costs of food truck businesses range from $50,000 to $100,000, while the expected annual revenue ranges from $250,000 to $500,000. One of the most significant advantages that food trucks offer is convenience. Many people, especially city residents, have busy schedules and limited time to sit down and enjoy their meals. Two of the problems that many consumers had after the expansion of the food truck industry in 2008 was that there weren’t a lot of meals to choose from and that the food was not particularly healthy. 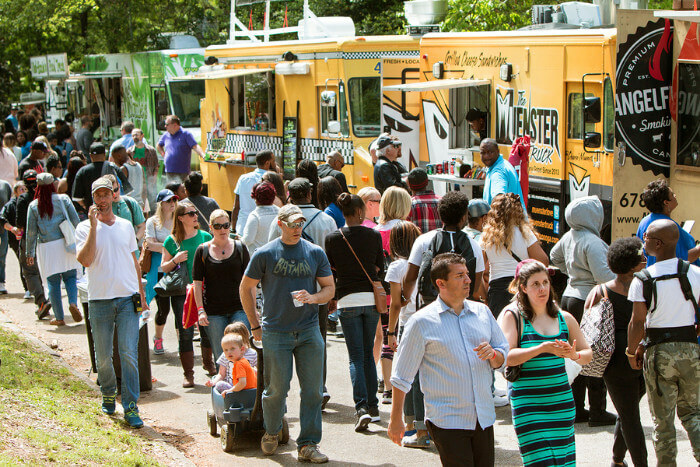 Many food trucks responded by adapting their menus to meet the health and culinary demands of consumers, thereby establishing a firm foothold in the food industry. Today, you don’t have to settle for food truck products that don’t meet your requirements concerning convenience, health, and food type because of the great variety. Locating a food truck that serves your type of food is also more accessible than ever with services such as Truckster. Because of food trucks’ popularity and despite several challenges with local government prohibitions, resistance from restaurant owners, and vigorous competition with fast food outlets, the food truck industry is growing at a rapid rate. According to several market research firms, the food truck industry is growing at an annual rate of around 7.9 percent, which is immense in comparison to the yearly restaurant industry growth rate of 2 percent. Researchers also estimate that the total value of the U.S. food truck industry will grow to $996.2 million by 2020. If you have a little bankroll and a love for preparing food, investing in a food truck today can result in sky-high returns.